I'm off to a slow start today, but it's a lovely slow start. I'm on my second cup of coffee and about to enjoy a bit of reading before I head out of my house for the day. Before I get into all that, though, I thought I'd post some brief shorts about a few books I've read. I don't post about every book I read, just certain ones. I'll finish a book and feel I should make a post, good or bad has nothing to do with it. It's just...a feeling. Lately, though, it's been a lack of time to blog. This is my busiest season at school (not that they aren't all busy), schedules get more hectic and more is expected than usual and work hours are very long. So, here are some shorts for you. Some are sweet, some are semi-sweet,...and some aren't sweet at all. The story is about a man who grows up loving the cinema his uncle owns. It is now present day, and he is the owner of the old cinema. When a young lady begins coming to the cinema alone on 'old movie night,' the man thinks he may have found love. The problem is, he'll have to go to great lengths to unravel a mystery before he can answer the question of love. I took a chance late one night and downloaded a book to my Kindle. I didn't have high expectations, I was just looking for a brain rest, a distraction. What I discovered was quite a surprise. 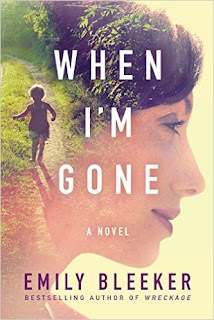 When I'm Gone by Emily Bleeker starts out like the movie, "P.S. I Love You' - or, at least, that was the first thing that came to my mind in the first few chapters. Wife dies, husband buries her, a letter from the wife arrives after the funeral...and more letters after that. Sounds like the movie, yes? I thought so, but the more I read...I realized there was much more to it. First, the husband is now the only caregiver for three children. Second, he's always been the working dad, his wife was the stay-at-home mom. Of course, nothing has been normal with his wife's long-term illness, but he hasn't been the one making sure the kids were cared for. His mother-in-law and his wife's best friend had helped when his wife was ill. Now, he has to figure out how to raise his children, work, and live his life without the only woman he's ever loved. He's only in his mid-thirties, life wasn't supposed to turn out this way. Third, and worst of all, he discovers his wife may not have been the person he thought she was. And that may be the point that breaks him completely. The story is more than it appears on the surface, or in the beginning, and I'm so glad I read the whole book. It is well-written, moves at a good pace, and has little nuances I really appreciated. The only reason I put this book in the 'semi-sweet' category is because it does deal with death and grief, but it isn't a depressing book. It's really a book about, "Do we ever really know each other?" and it's a book about hope and the power of restoration. And unfinished. I seldom abandon books, so you should know just how unsweet these two are and I confess, up front, I did not finish them and have no desire to revisit them later. I bought Just Kids by Patti Smith for two reasons: I like Patti Smith, and Joan Didion recommended it. That's it. I figured it was a win, win. Nope. I was wrong. I made it to page 106 before I decided I just couldn't take it anymore. Maybe some people enjoy reading the train wreck people make of their lives for WAY too long. I don't. 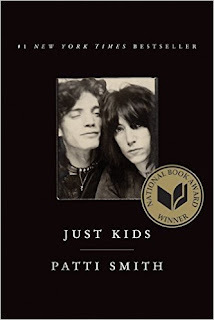 I've always considered Patti Smith a wise person, and I assume she is now because she messed up over and over and over again when she was younger. While I realize this book is a National Book Award Winner, it was not a winner with me. And I am going to do something with it I have only done one time before in my life: I'm taking it to Half-Price Books and selling it to the second-hand bookstore if they'll have it. If not, I'll just give it to them. While I have done that with a David Baldacci book before, I had - at least - read the whole book to make that judgment. This will be the first time I've ever done it without finishing a book AND, I might add, a book I paid FULL PRICE for at Barnes and Noble! I cannot, though, in all good conscience, keep a book in my home I don't like. That will never happen. I bookmarked my spot and looked up reviews on Goodreads. The first bad review I read said exactly what I thought: chick lit, too much, too fast, not enough development of characters, and not historical fiction. 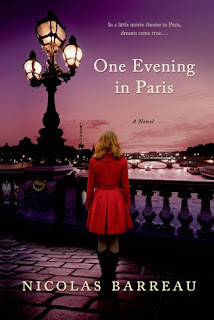 The book was promoted as historical fiction and compared to The Paris Wife by Paula McLain, which I loved. This book is NOT like The Paris Wife. Once upon a time, Robuck read A Farewell to Arms by Ernest Hemingway and fell in love with Hemingway, as so many of us do (myself included). She admits this much in her note to the reader at the beginning of the book. I will assume she read The Paris Wife after that and thought, "Hey, I can write something like that!" What came out is book that reads like a high school girl's fantasy. The story surrounds a beautiful, poor, 19-year-old, Cuban-American girl in Key West who becomes Hemingway's maid during the time when he was married to Pauline (after divorcing Hadley and leaving Paris). 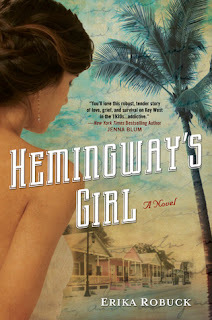 She's instantly attracted to Hemingway and feels something "electric" between them at every glance and every touch. Everything happens too fast, is too cliché, and there's a bit of name-dropping, as well. I might look at it differently if the narrator was telling the story from her point-of-view. I would then say it sounds like a teenager because, well,...the narrator IS a teenager. But that isn't the case. It's written in third person and, as I said, not written well. I will say, however, the cover is lovely and I like the title. And I like the idea, the premise, of the book. I believe it could have been a really great book. And, as much as I love Hemingway (and as much as I've researched him), I don't see him in the same way this author does. She seems to have the caricature version of him instead of the real man. Of course, that goes back to the high school girl fantasy thing. And, I will admit, I'm not fan of that type of genre,...not even when I was a high school girl. I'll put this one in my mental category of Twilight and move on. Now, the question is,...what will I read next from my TBR pile?